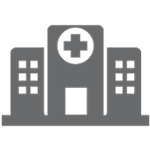 Hospitals are the health care institution that provides patient treatment with specialized equipment and methodical staff. Have you ever been confused by reading the title or name of a hospital? Like sometimes there's a charitable hospital, and wonder why they are different than our government or private hospitals.